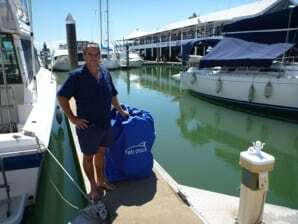 Mal and Wendy took delivery of their FAB Dock to protect their 9 metre Markline from the tropical waters in Cairns. We had a beautiful warm and sunny autumn day for the installation (makes a nice change from the recent cold and wet days I have been installing in lately). We didn’t get a chance to go croc hunting this time, but for my first trip, Mal took me out in a six foot plastic bathtub looking for 16 foot man eaters. The math just didn’t quite seem to add up. Is that what they call tropic fever? 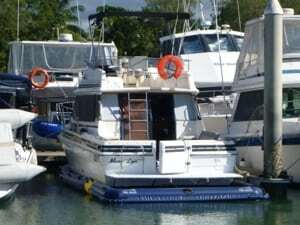 And if there is any more proof required as to why everyone in Cairns should get a FAB Dock under their boat, they need look no further than Mal’s marina neighbour.